Credit purchase is carried out via PayPal or bank transfer. You can pay by credit card or via transfer from your PayPal account. Move the mouse over the SMS in the osCommerce main menu and choose Purchase credit. 1. Select the desired amount of credits and click on Buy Now. You will be redirected to the PayPal payment gate. 2. 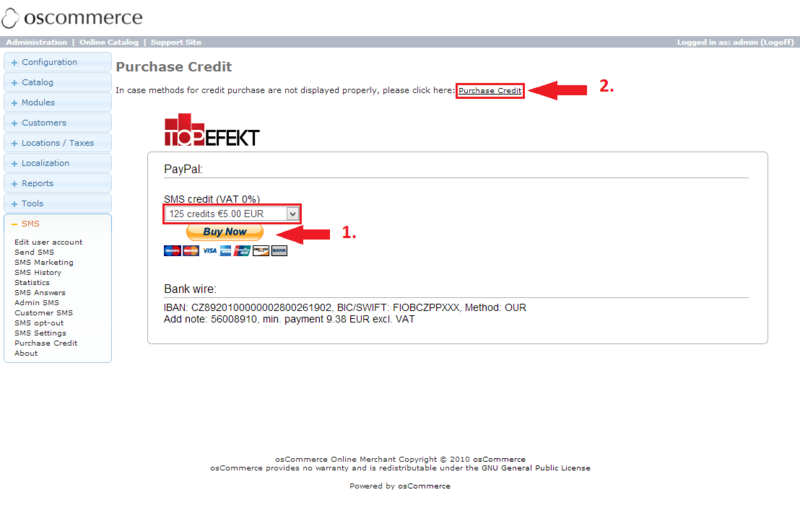 Use the link Purchase credit only in the case when the frame for credit purchase (Buy Now) does not appear - i.e. security policy of your hosting provider. NOTE. : If you want to use purchased credit in multiple e-shops simultaneously, use for all module activation the same username and password (the username and password you have received during activation of the first sms module).